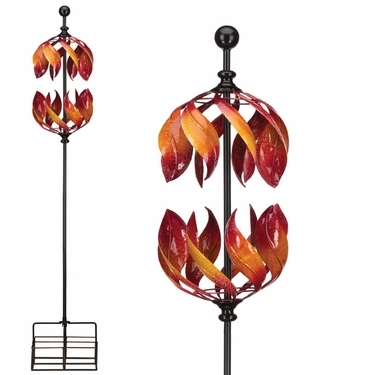 Our new Double Flame Vertical Kinetic Stakes bring dramatic excitement to the garden with sideways spinning blades and discs. Heavy-duty bearings allow each moving element to spin freely. The beautiful hand-painted finishes are applied over powder-coated metal that is weather resistant. Available in four styles: Double Flame, Butterfly Dance, Orbit and Flower. Watch our New Double Flame Spinner in Action!